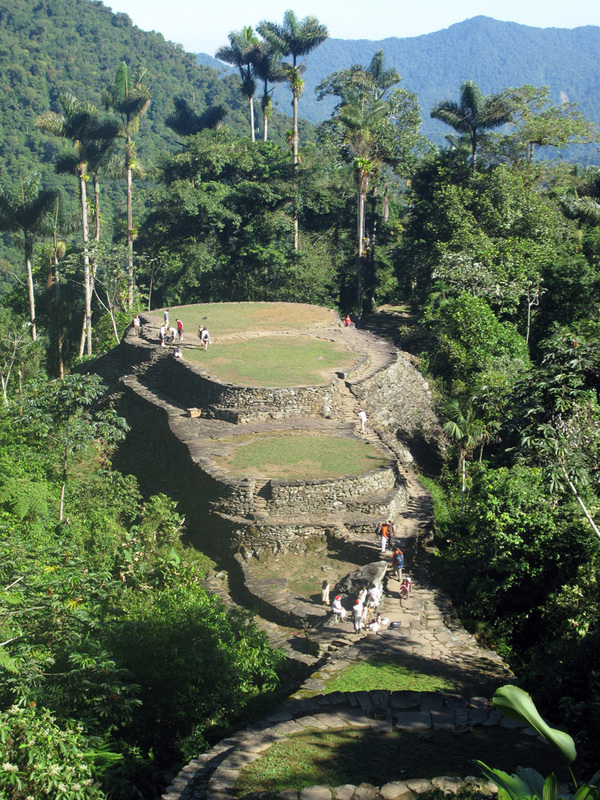 La Ciudad Perdida – discovered in 1974. With the holidays fast approaching, we started making plans to ensure that Christmas far away from family and friends, in a tropical climate, would still feel like a real Christmas. It wasn’t so hard to do, since we were lucky to share the holidays with some newfound friends in a small and beautiful fishing village on the Caribbean coast of Colombia. 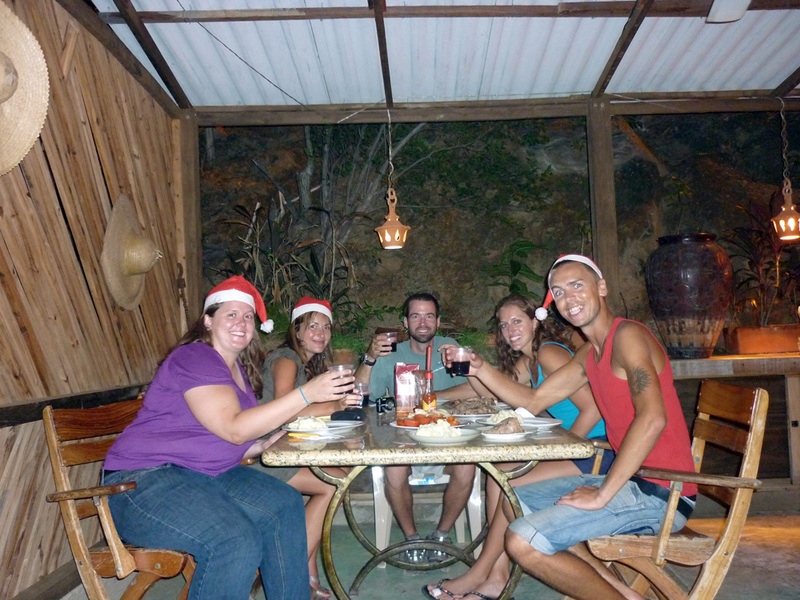 From Cartagena, we headed north to the town of Taganga, where we intended to rent an apartment and spend a quiet but charming Christmas with our friends Jim, Kirsty and Aynsley. We soon discovered that a million other gringos had that same idea, so we ended up crossing paths with familiar faces everywhere, which made for a very lively holiday. 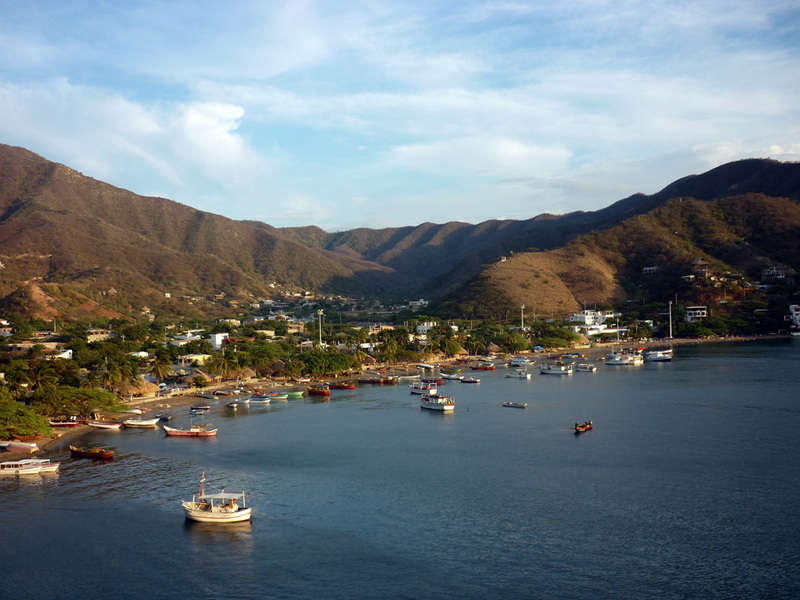 Taganga – a small fishing village where we spent Christmas. Photo by Aynsley. The only downside was that lodging was hard to come by, and what we had imagined to be a well-kept three bedroom apartment with a full kitchen, a spacious common area and perhaps a nice vista, turned into a cramped 2-bedroom suite on the 2nd floor of “The Mirador” – the most popular bar/restaurant in Taganga with rumbas (parties) every night until 4 AM. Needless to say, we did not sleep very well, but we did get to wake up every day to a beautiful view of the beach. And on Christmas Eve, the owners reluctantly let us use their kitchen to prepare a superb Christmas dinner – steak, mashed potatoes, grilled tomatoes and onions, with boxed vino tinto (red wine) and brownies for desert. It was delicious! 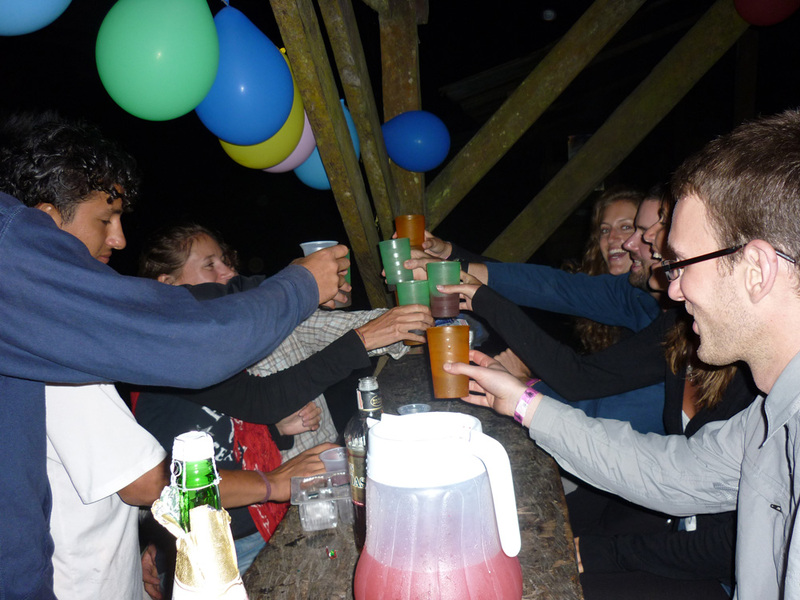 Later in the evening, we all headed to the beach and continued the celebration well past midnight. 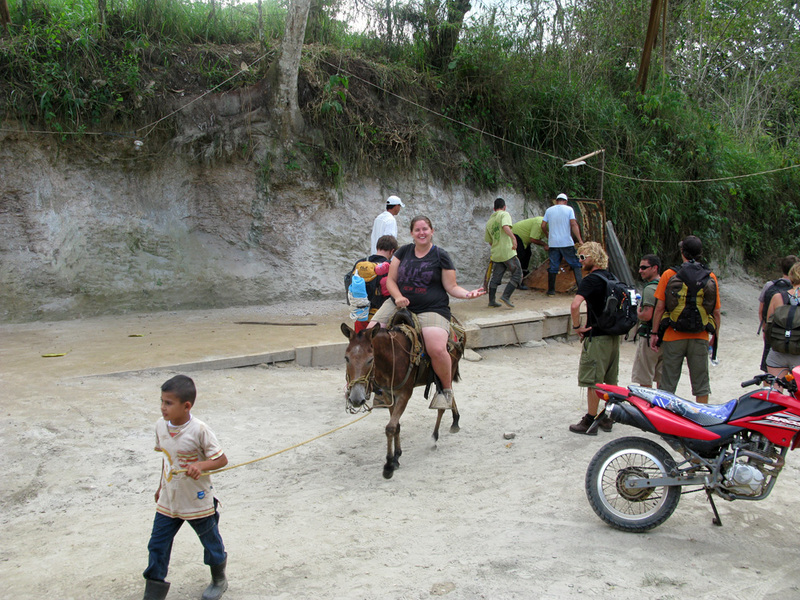 At one point we were solicited to participate in an “integration” activity with the locals where we were asked to hold hands, dance around in circles and recite some Spanish chants that didn’t quite make sense. Perhaps it was a Colombian tradition, or a deceitful gesture made to embarrass the gringos. No one really knows. For Christmas the next day, we exchanged gifts, spent the day on the beach, drank mango smoothies and talked to our families on Skype. It turned out to be a delightful Christmas! Our view from the Mirador. Cooking up some vegetables to go along with the steaks and mashed potatoes. Christmas eve dinner with good friends. 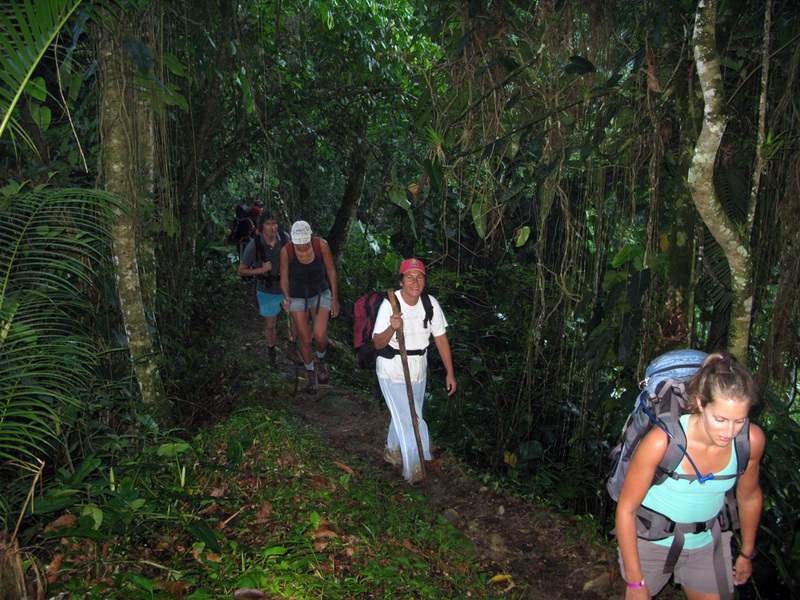 Also, perhaps in the midst of the Christmas spirit, we all nervously conceded to booking a 5-day guided trek through the dense jungles of Colombia – what seemed to be a perfect, albeit untraditional, way to reign in the New Year. 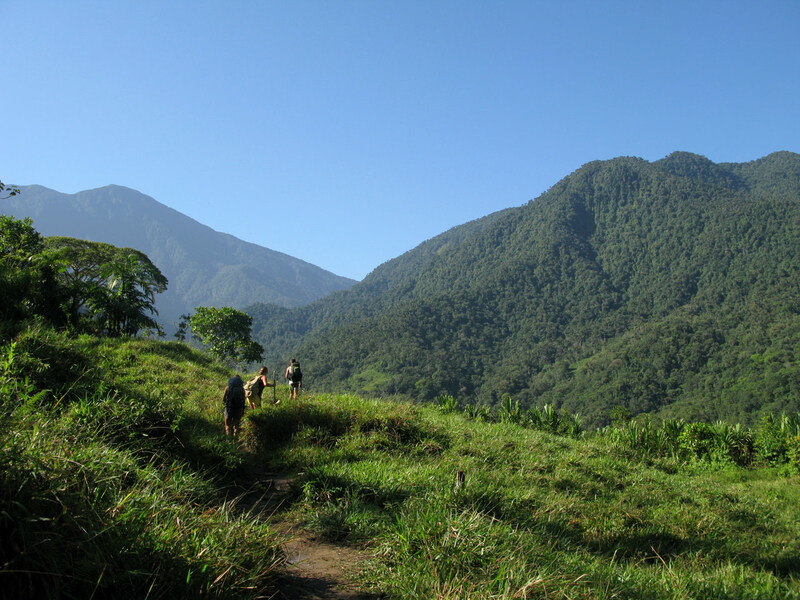 In fact, this was not just any trek but a journey through the undulating hills of the Sierra Nevadas, passing through indigenous villages and crossing a network of streams and rivers until we reached a secret staircase that would lead us up to the Ciudad Perdida – the Lost City, an archeological site of an ancient city dating back to 800 AD. The Lost City was only recently discovered and pillaged in 1974 by tomb raiders. 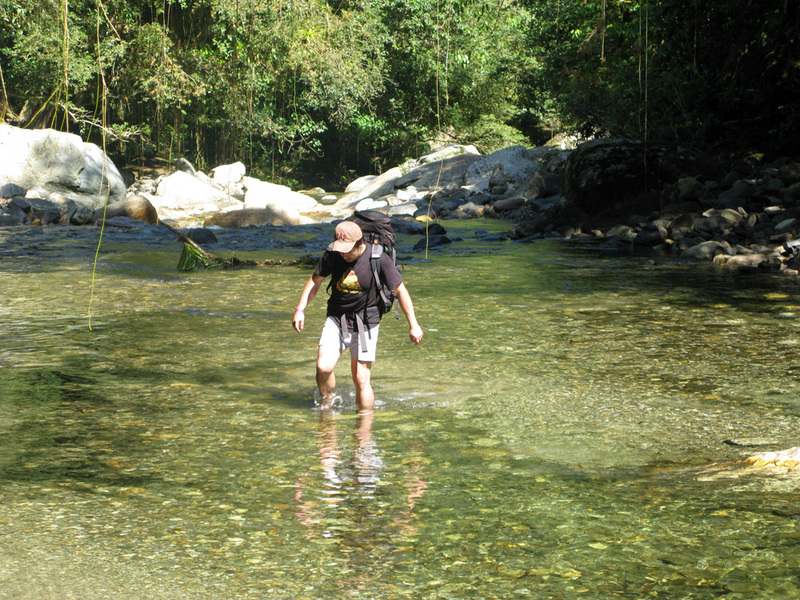 This adventure seemed ripe with novelty and mysticism – a fine way to start the New Year. So we set off on a Tuesday with only a few changes of clothing and personal items. All was to be provided for us – food, water, hammocks, blankets, etc. We could have opted for mules to carry our bags, but we clung to them happily since trekking isn’t trekking without a little weight on your shoulders. 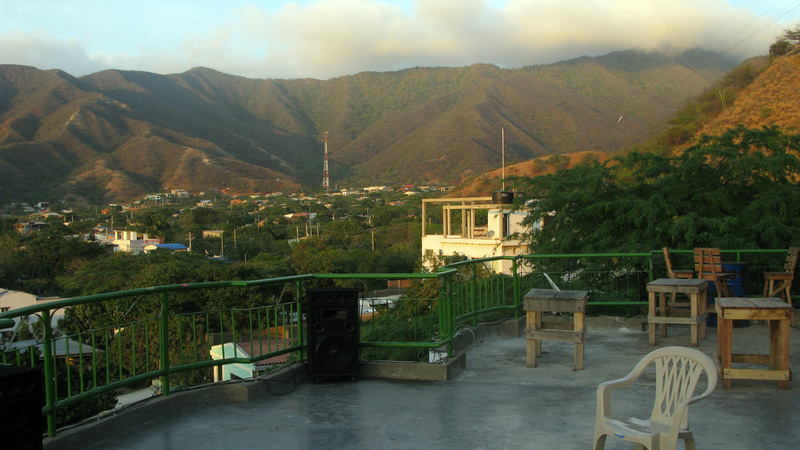 We quickly became acquainted with our group of 9, which included the 5 of us along with a Dutch couple Sarah and Harm, an Englishman David and a Colombian native Diego. Our friendly though slightly immature guide Miguel brought along his parents, whom we quickly started referring to as Mama and Papa, out of fondness when we discovered they were such good cooks! 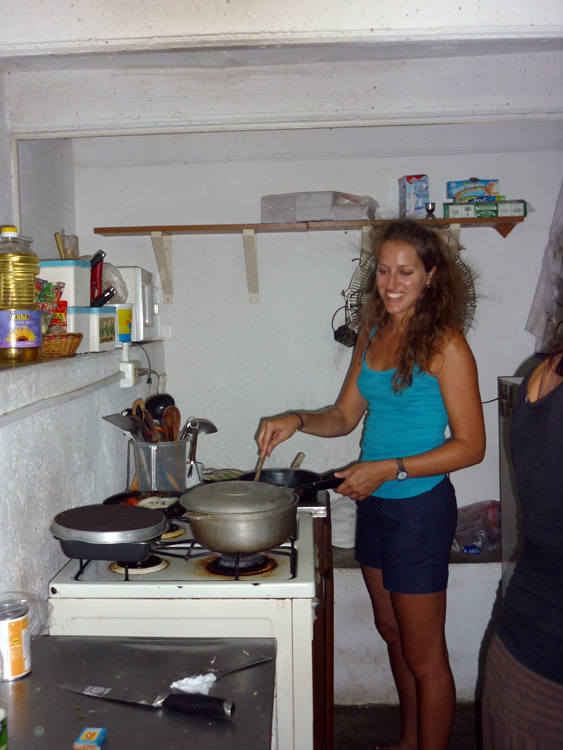 In the mornings they would make us either a plate of fresh fruit, scrambled eggs or empanadas accompanied with coffee and hot chocolate. Lunch was mostly sandwiches if we were in the middle of hiking and a hearty soup when we arrived at camp. 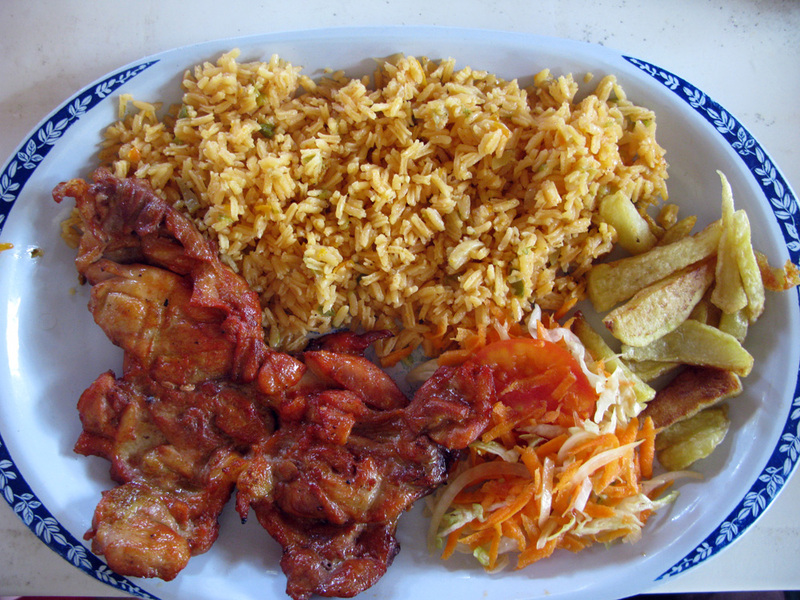 Dinners consisted of chicken or carne (meat) in salsa with rice/lentils or pasta with juice and occasionally cookies. We needed the fuel, since we hiked between 4 and 6 hours a day. And this was uphill and downhill and uphill and downhill again on rocky and muddy paths. Fortunately these were most always interrupted by dips in piscinas (swimming holes) and snack breaks where they served fresh pineapple or watermelon. 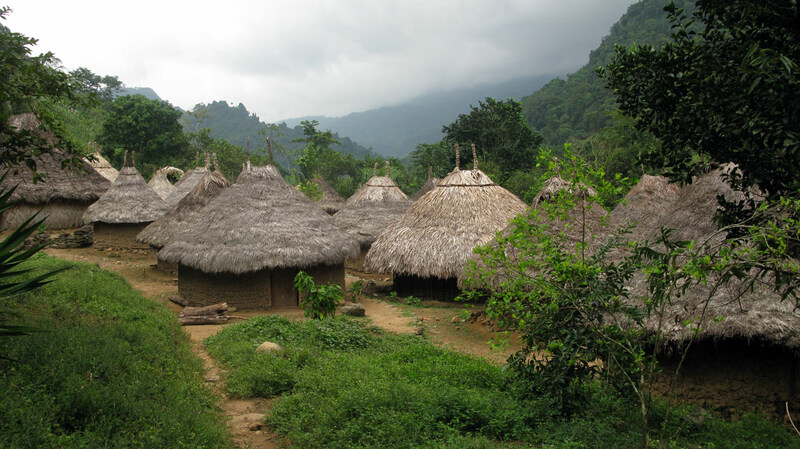 Along the way, we ran into a number of small villages, where the native people live off the land in huts. Dressed in long, featureless white frocks and always barefoot, whole families (including small children carrying loads on their head) would pass us going up hills. It was very humbling. 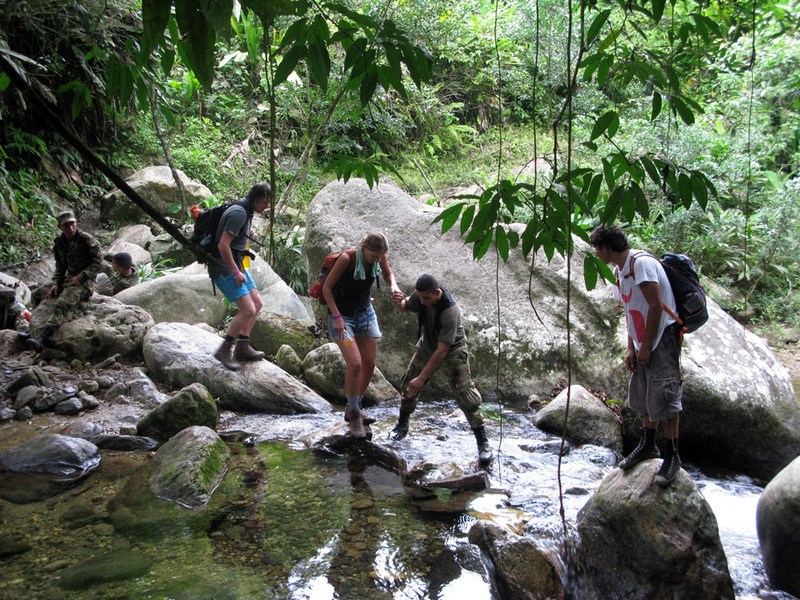 Jim and Kirsty prepared for the Lost City trek with their new ‘trainers’. Pat and Jim taking a dip in one of the many ‘piscinas’. Glimmering from the sweat-pouring climb on the first day. When we finally got to camp in the evenings, we would wash up in the river (or primitive showers if they had them), wind down, eat dinner and hit the sack soon after. They set up hammocks with mosquito nets for us at night, which were usually a little too close together and had quite the domino effect. If you moved, everyone else moved as well. If you switched your feet to the left, everybody to the left of you would need to do the same. The first couple of nights were a bit sleepless, but exhaustion soon took over. The village of our first camp. 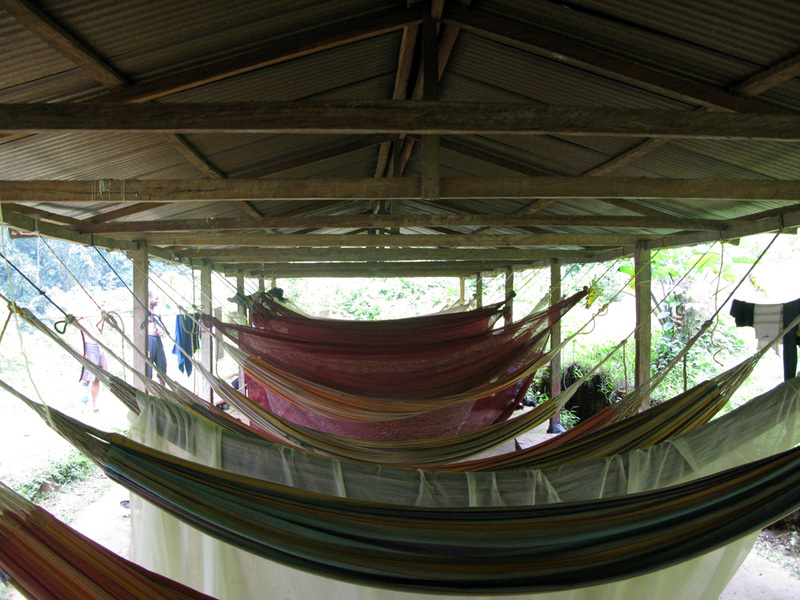 Our sleeping arrangements – hammocks and mosquito nets. The lush hill sides of the Sierra Nevadas. We plunged off rocks to cool off. 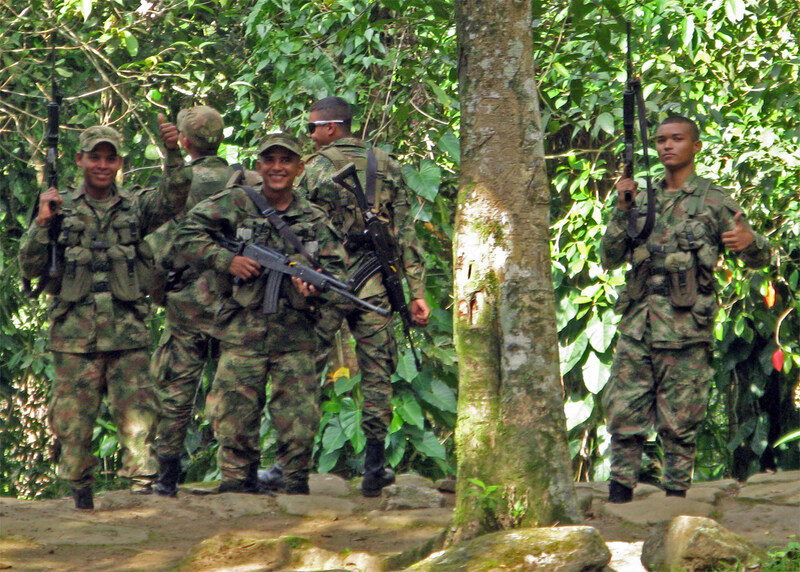 Colombian soldiers helped us cross the river. 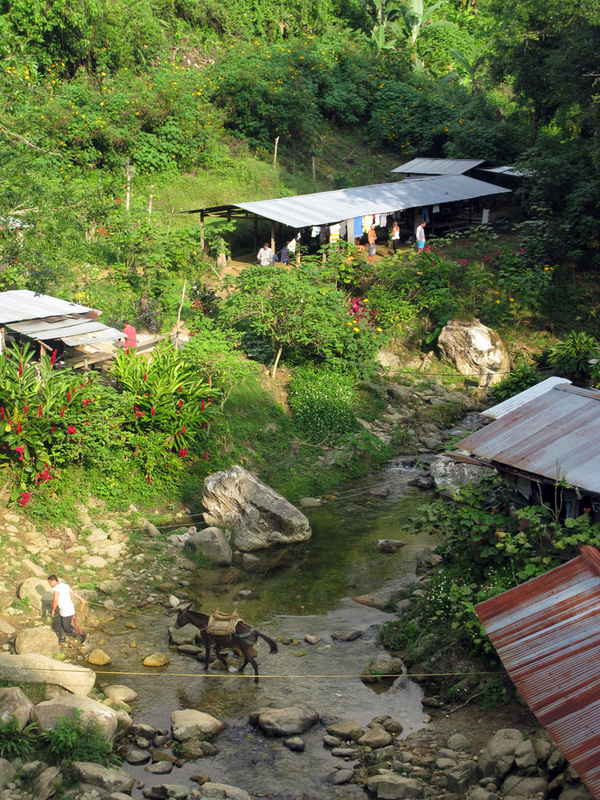 A small indigineous village tucked away in the Sierra Nevadas of Santa Marta. Part of our group with Mama and Papa Miguel. We would start our days fairly early (up at 5:30), mainly because we were determined to beat all the other groups to the next camp. 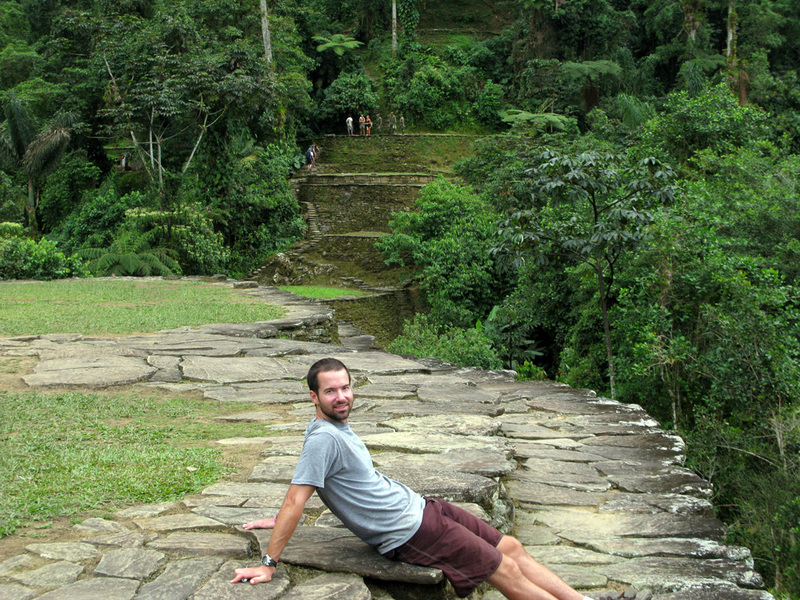 And on New Year’s Eve, we hiked quickly so that we could enjoy the Lost City in a few hours of daylight. 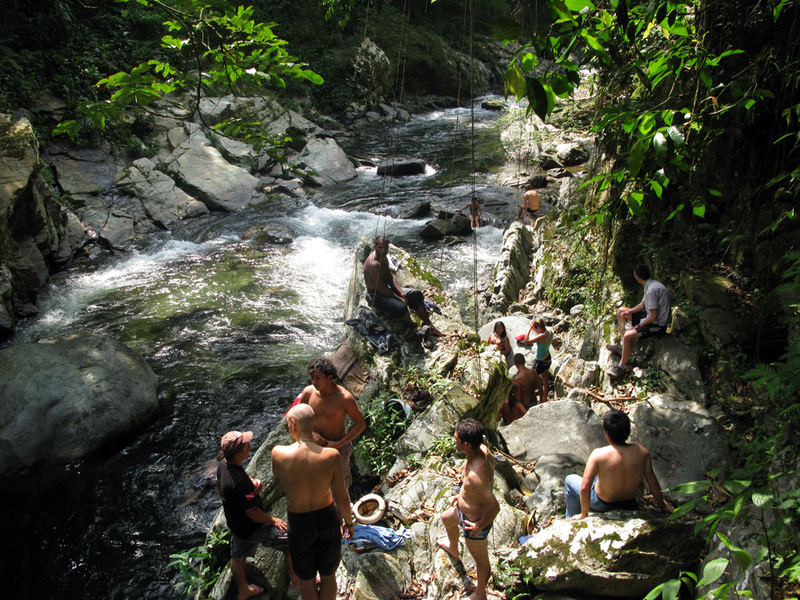 After a 6 hour trek up and down hills, scrambling over rocks and crossing the river 7 times, we finally arrived at the foot of the 2,000 steps leading up to the Lost City. That took another 30-40 minutes until we reached the top, where suddenly everything became serene and tranquil, and the day’s grind quickly faded into contemplation over a city so sacred that its people hid it from their conquerors even if that meant torture or death. 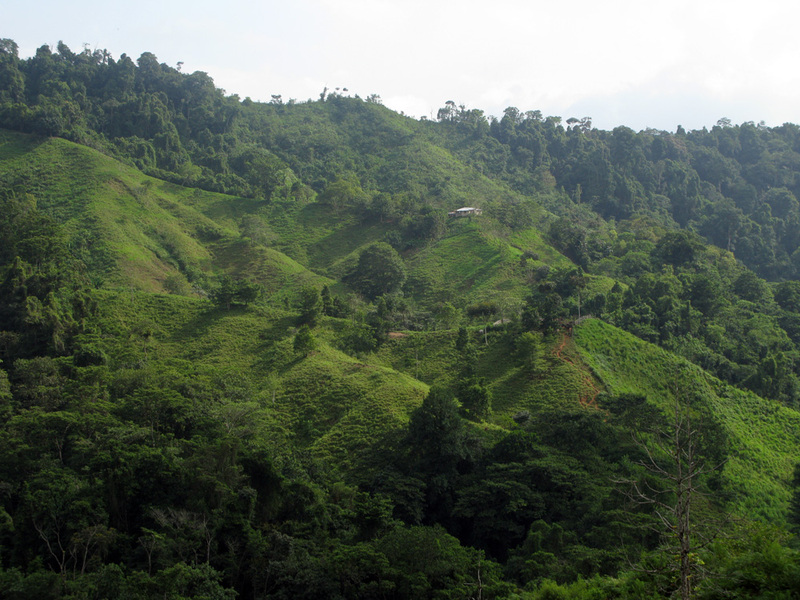 We wandered through the many terraces (once houses), gazed at the spectacular views and chatted with the Colombian soldiers who guard the area for 4 months at a time. 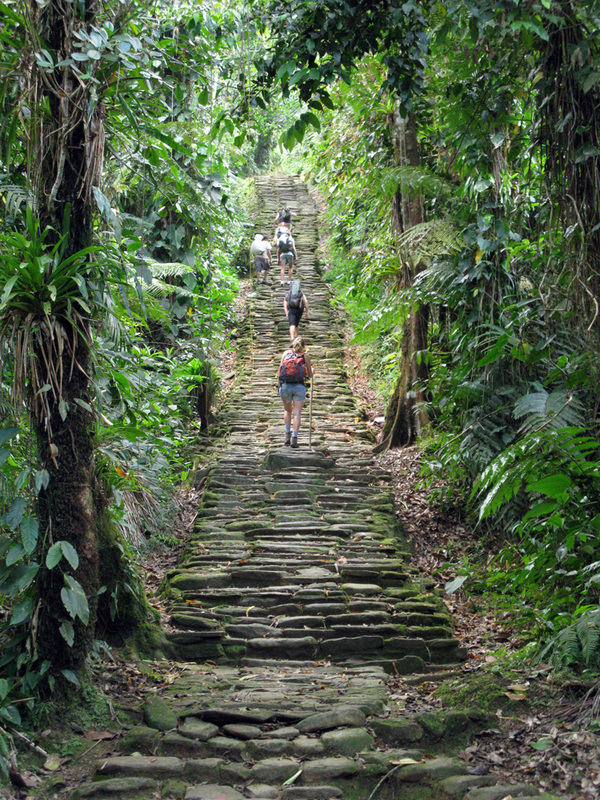 The Lost City is two climbs, one valley and 7 river crossings away! 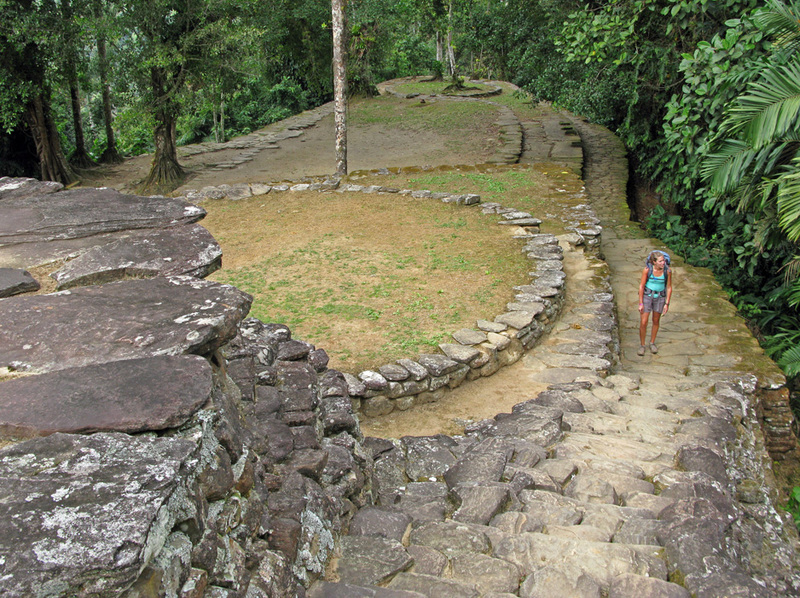 Climbing up the last of the 2,000 steps up to the Lost City – these are the ceremonial stairs. 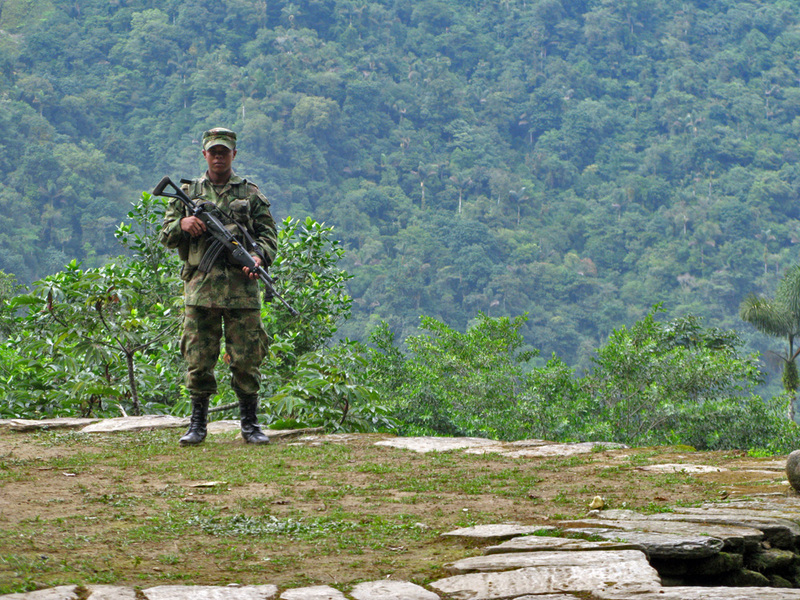 The young Colombian soldiers who guard the Lost City for 4 months at a time. 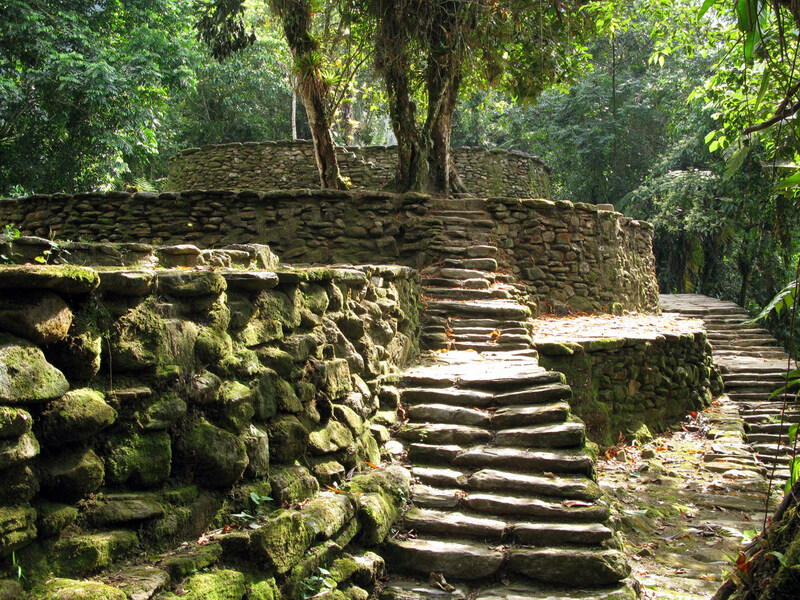 Each of the 169 terraces are the old foundations of the ancient homes. Exploring the sacred city hidden from the world for so long. Some r&r after a 6-hour hike to the Lost City. 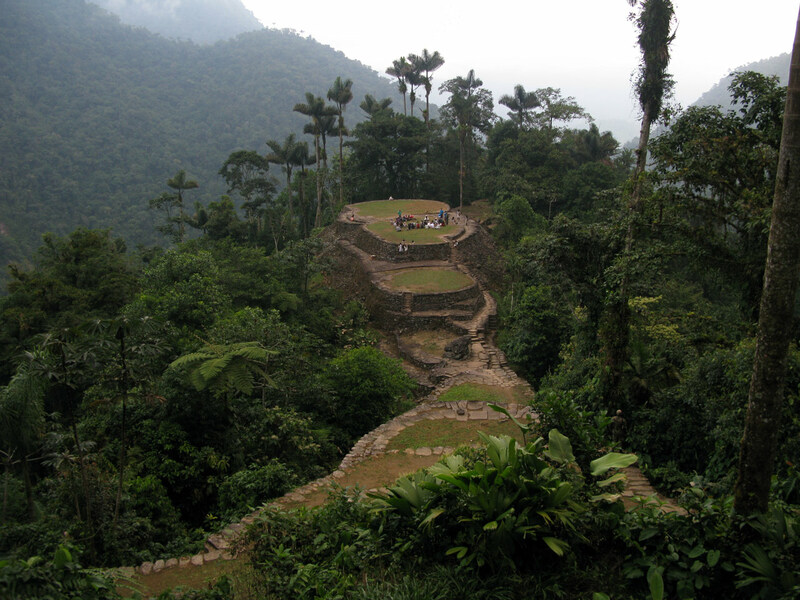 Tourists gather around the Shaman on the main terrace of the Lost City. We felt safe - there were also special forces keeping an eye on the city from a distance. We were a bit disappointed when we got to camp, since they clearly hadn’t accounted for us and scrambled to get enough mattresses and blankets to accommodate our group. There was already a group of 25 there who was spending 2 nights, officially against the rules but not enforced, of which we suffered the consequences. We each had brought a bottle of champagne or rum and quickly started celebrating, literally, since we finished everything by 8. It was enough to cheers both the English and Dutch New Year, though not quite enough to make us forget our day’s hike and stay awake until midnight. 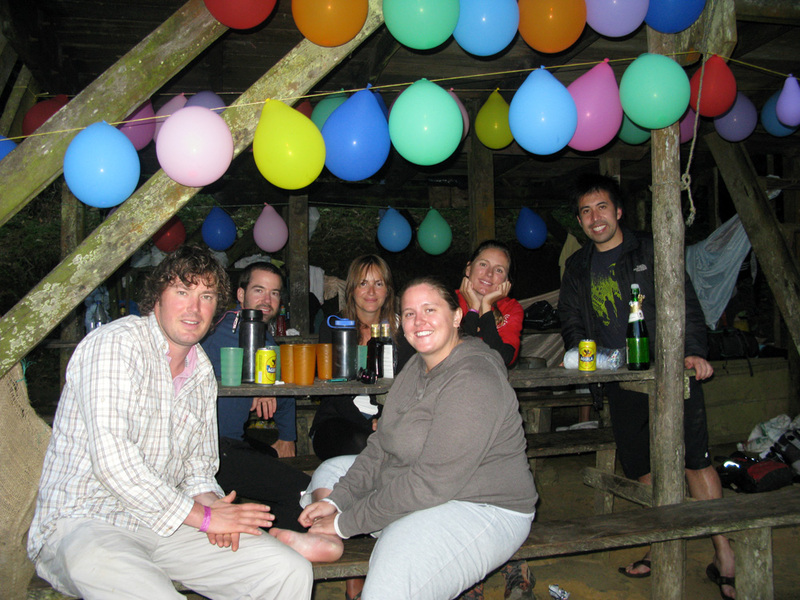 A festive camp to celebrate the new year. Happy new year! We didn’t make it till midnight. In our last 2 days hiking back, we somehow managed to fit in quite some drama, both good and bad. 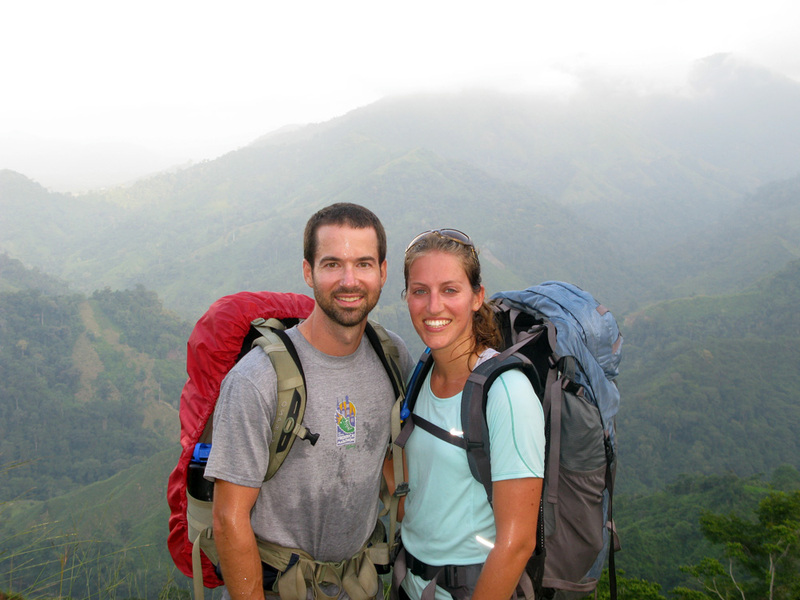 To start off 2010, we were honored to witness the engagement of Sarah and Harm on the King’s throne of the Lost City. It was such a beautiful and fitting way to celebrate their 10th year together at the turn of a new decade. Pat was asked to photograph the event just minutes prior, which he handled gracefully. 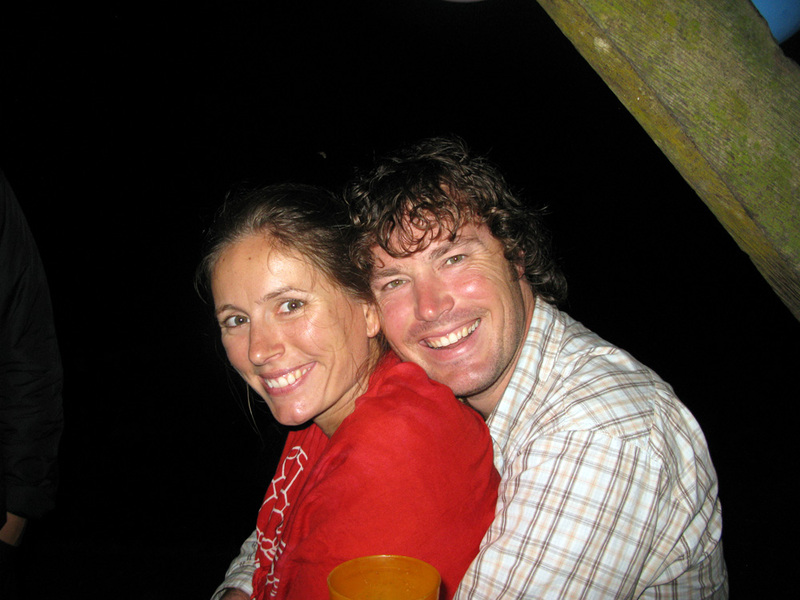 The happy couple – Sarah and Harm. A marriage proposal marks their 3rd decade together. 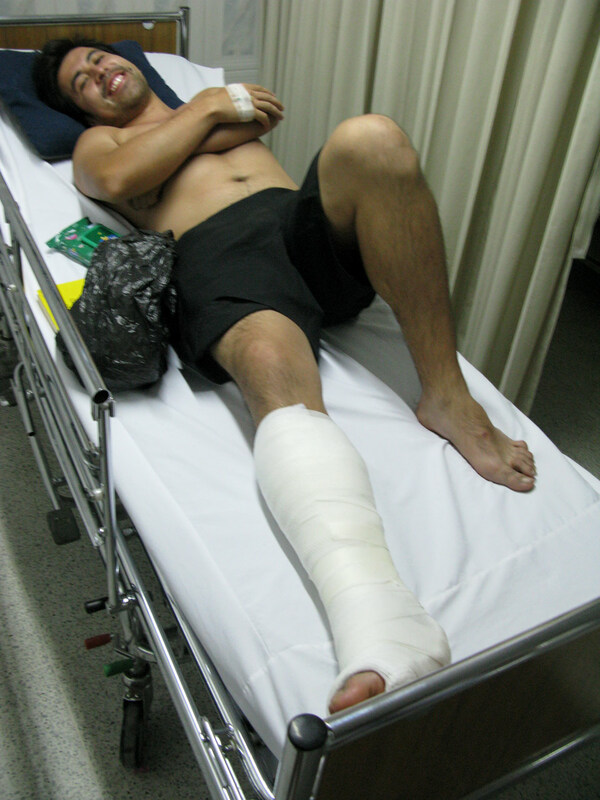 On the final day, just a few hours shy of the finish line, another member of our group Diego slipped during a river crossing and cracked his ankle enough that you could see his tibia bulging out under his skin. It was quite obvious that he could no longer walk and had to be carried out immediately. 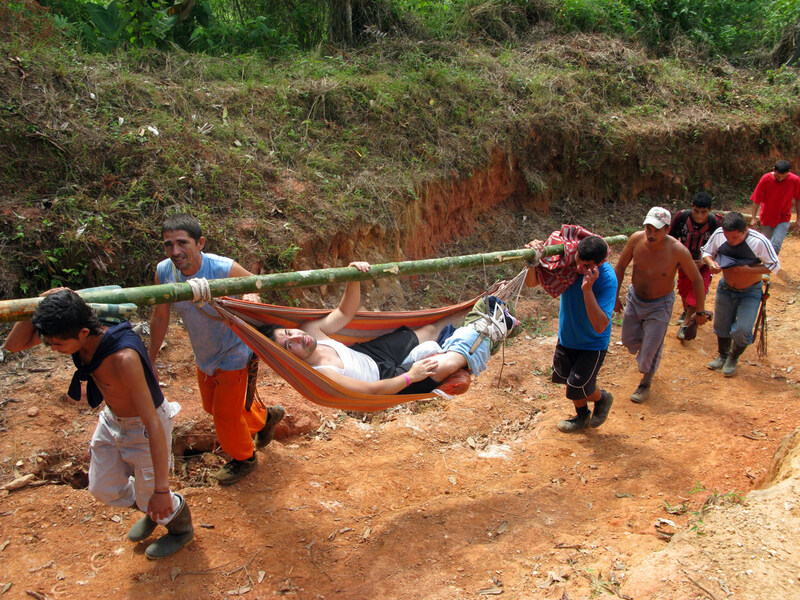 Pat’s Wilderness First Aid training came in handy when he built Diego a fine splint to immobilize the ankle as he was carried out on a hammock by a team of speedy Colombians. 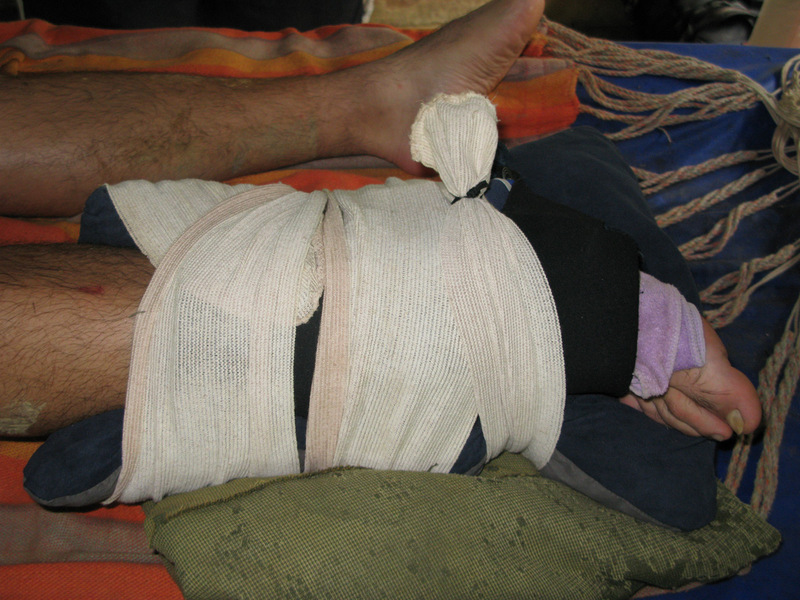 We were a bit disappointed at the lack of first aid training available and had to guard Diego’s ankle so that nobody would touch it, aggravate it and cause more pain and damage. Harm succeeded in scaring away the witch doctor, who wanted to put the ankle back into place, with a few forceful shouts. A wise precaution since Diego’s ankle was most definitely broken and needed 5 screws and some tendon reconstruction to put back together. Our friend is doing very well and was a champion throughout it all! The start of Diego’s splint for his broken ankle. 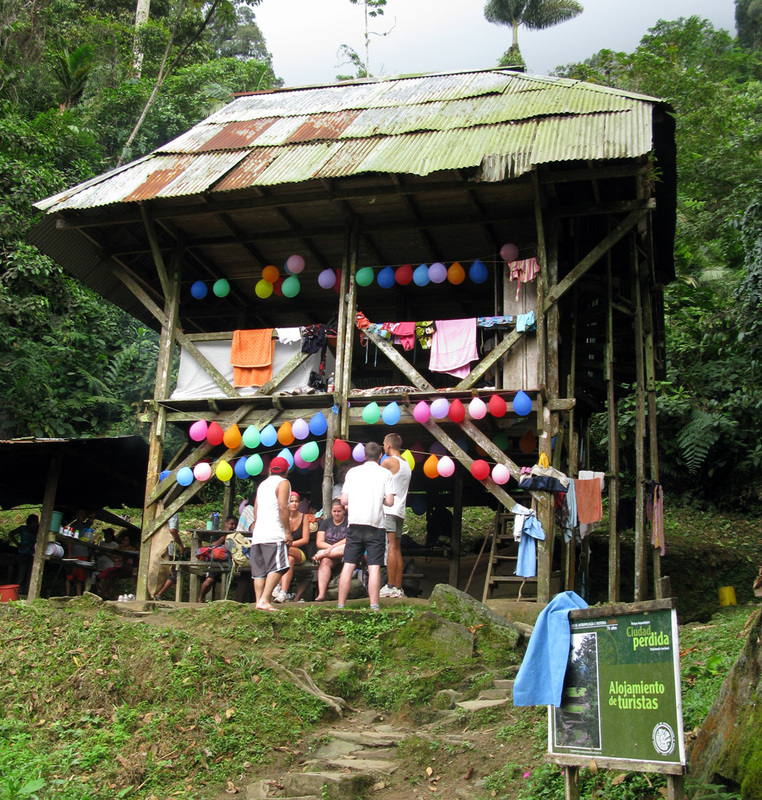 Diego’s personal porters – they ran up and down the mountains in record time. 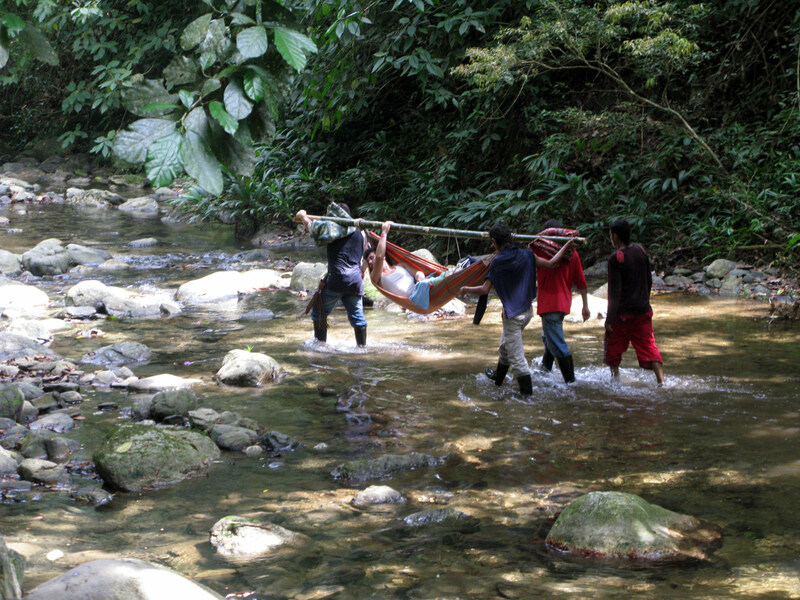 Here’s Diego safely crossing a river earlier in the trip. Aynsley crosses the finish line in style - her heels plagued with blisters. Our last lunch awaits us at the finish line. Diego’s ankle back in place – awaiting surgery the next morning. Despite the drama towards the end, we had a wonderful time and consider this trek to be a highlight of our trip so far. And of course after 5 days of grueling physical activity, there’s nothing better than taking a few days to rest, sleep in, watch a little TV, read some books and plan for the next big adventure! happy new year! been following you guys all the while but had to catch up with the blog since the finca post. glad you’re both happy, healthy and smiling! Good Times! Massive post! I’m off to Puerto Rico tomorrow, can’t wait! You gotta work on that tan Pat. Travel well.